The Ontario Provincial Parliament’s Standing Committee on Finance and Economic Affairs has chosen Hamilton, Windsor, Thunder Bay, Sault Ste. Marie, Ottawa and Toronto to hold pre-budget consultations. We are now entering the 9th consecutive year of hospital cuts – the longest stretch of hospital cuts in Ontario’s history. Every service cut is privatized, subject to user fees or moved far from our home towns. 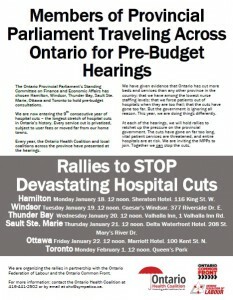 Every year, the Ontario Health Coalition and local coalitions across the province have presented at the hearings.We have given evidence that Ontario has cut more beds and services than any other province in the country; that we have among the lowest nurse staffing levels; that we force patients out of hospitals when they are too frail; that the cuts have gone too far. But the government is ignoring all reason. This year, we are doing things differently. At each of the hearings, we will hold rallies to ratchet up the pressure on the provincial government. The cuts have gone on far too long, vital patient services are threatened, and entire hospitals are at risk. We are inviting the MPPs to join. Together we can stop the cuts. Hamilton Monday January 18. 12 noon. Sheraton Hotel. 116 King St. W.
Windsor Tuesday January 19. 12 noon. Caesar’s Windsor. 377 Riverside Dr. E.
Thunder Bay ?Wednesday January 20. 12 noon. Valhalla Inn, 1 Valhalla Inn Rd. Sault Ste. Marie Thursday January 21. 12 noon. Delta Waterfront Hotel. 208 St. Mary’s River Dr.
Ottawa Friday January 22. 12 noon. Marriott Hotel. 100 Kent St. N.
For more information: contact the Ontario Health Coalition, 416-441-2502 or by email at ohc@sympatico.ca. We are organizing the rallies in partnership with the Ontario Federation of Labour and the Ontario Common Front.